Physical therapy examines the science of movement, how our muscles move our body, and how abnormal muscle activity may lead to movement disorders or developmental delays. A physical therapist can provide evaluation, assessment, consultation, and care for children who require therapeutic intervention. 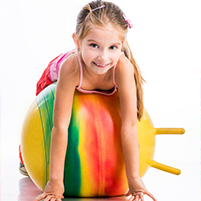 There are many reasons why a child might need physical therapy. Physical therapy addresses a variety of pediatric orthopedic impairments, disabilities, and changes in physical function and health status, such as fractures, dislocations, muscle strains, and ligament sprains due to injuries, disease, overuse during normal daily activities, or other causes. During the normal developmental process, we achieve certain developmental milestones within a certain age or time frame. A child who demonstrates a delay in achieving these milestones, may be the best candidate for physical therapy. A physical therapist works closely with patients and their parents to promote strengthening, endurance, and proper motor development to ensure the child has the best opportunity for growth and well being. We are actively involved with the multi-disciplinary team to meet patient-oriented goals. Our team is involved with the medical, therapeutic, and support services delivered to children in the outpatient and developmental school environments. At Pediatric Therapy Network, we are committed to promoting the development of children with disabilities to their fullest potential, while providing guidance and support to their families. It is our goal to provide care in a family centered environment that provides support for the successful outcome of physical therapy. We look forward to serving your therapy needs.